What is the real power of “access to information”? Recently in El Salvador the authorities confirmed that citizens have the right to ask for information on the assets of public officials. What happened next is a powerful contribution to the debate around the effectiveness of transparency tools for accountability and citizen mobilisation. Since the ruling in July by the official access to information authority that citizens have a right to access information regarding the asset declarations of public officials, Salvadorean citizens have submitted almost 6,000 requests for information. Already, cases have been identified where the wealth of public officials grew by 300 per cent during their time in office. Transparency International´s local advocacy and legal advice centre FUNDE ALAC, is taking things a step further, and has requested to also be granted access to the internal audits of the assets of public officials. The El Salvador Advocacy and Legal Advice Centre is one of the 66 centres operated by Transparency International chapters around the world, providing free and confidential legal advice to witnesses and victims of corruption. 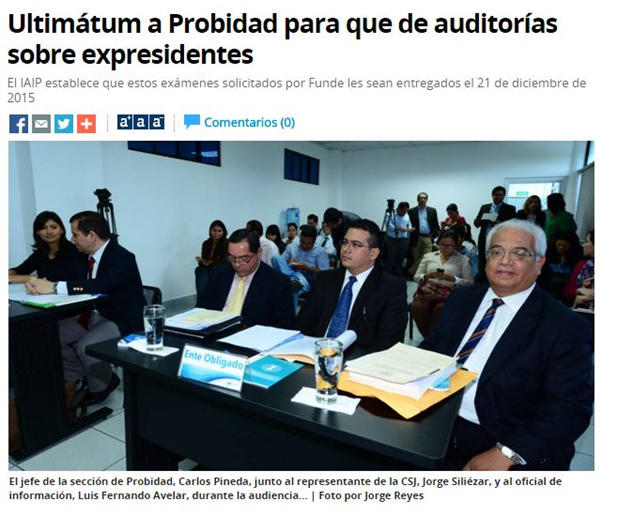 When the legal advice Centre in El Salvador recently asked to see the audits of the wealth of three former presidents, Francisco Flores, Antonio Saca and Mauricio Funes, the request was initially turned down. However, the Access for Information authority at the end of October ruled in favour of citizens (and transparency), giving the Supreme Court until 21 December to provide this information. Roberto Burgos, the ALAC coordinator, is clear that the goal of these requests goes beyond transparency for transparency´s sake. He says “We want sanctions for the corrupt and investigations of the inexplicably high wealth of public servants who leave office as millionaires”. ← Why did Transparency International visit Jordan?